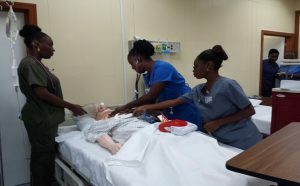 Basseterre, St. Kitts, 6th December, 2018 (MyVueNews.com) – New teaching methods in the nursing program at the Clarence Fitzroy Bryant College in St. Kitts are being heralded as a step in the right direction to administer a more modern type of teaching experience for student nurses. This should come as good news to many given the concerns being raised in the country about the significant drop in the number of persons enrolling in the faculty and the staff shortages being created at the local medical facilities. Dean of the Division of Health Sciences at the CFBC, Dr. Rondalyn Dennis-Bradshaw, recently revealed that the Nursing Clinical Simulation Laboratory at the institution has changed the way the school’s BScN Nursing Program is taught. Dennis-Bradshaw, explained that students are now better prepared to enter a real clinical setting. This she said is being facilitated by the new state of the art lab that was put in place earlier this year on 15th April. The Dean said that there is a significant difference between the previous methods of delivering the program to the one that is now in place. She explained that in previous times, the simulation lab had low fidelity mannequins that were not computerized. Students were therefore left with no option but to learn their first skills with the outdated method and equipment, including even the basic forms of bed-making, bed-bathing and dressings. However, “The simulation lab now creates an environment that mimics a real clinical setting,” said the Dean. “So whatever the students will experience in the hospital, they are first exposed to them in the simulation lab,” she said. In addition, the simulation lab allows the students to build their competence and, most importantly to, build their confidence as well, said Dr. Dennis-Bradshaw. “So we set the scenario with the blood and everything so that when the students get [to the hospital] they don’t (get nervous). They are accustomed now to that setting,” said the dean.